Down under the bridge where route 142 crosses the Río Tabacón northwest of the famous resort hot springs entrance is a bizarre monument to the melodramatic small town politics that constantly flow beneath the surface of La Fortuna like hot lava ready to erupt if a fissure in a tourist’s wallet exposes dollars. Gaps in the barbed wire near either end of the bridge open to small trails down to the banks of the steaming Río Tabacón. A couple of decades ago this was just a wide spot in the road where locals knew you could pull off and enjoy the thermal waters of the Río Tabacón. In 1993 the little restaurant and pool on the south side of the road was converted to terraced waterfalls and swim-up bars for an upscale resort named Tabacón and some simple changing rooms were added at Tabaconcito (little Tabacón) on the north side. Local Ticos and backpackers soaked at Tabaconcito in the same water, in similar terraced pools (albeit with a cooler full of beer instead of a swim-up bar) as the well heeled tourists across the street but at a tenth of the price. This segregated arrangement worked well until the Tabacón Grand Spa Thermal Resort started to overflow with day trip visitors from other area hotels degrading the experience of the resort guests. Tabaconcito was given a facelift, a price increase and renamed Las Fuentes to handle the overflow. When the locals were pushed out of even their modest balneario de aguas termales the political lava erupted. We’ve heard several versions of how the soap opera played out, but in the end public access laws won out and the resort capitulated knocking down the changing rooms and other buildings leaving an eerie Stonehenge of partial walls sprouting twisted plumbing. 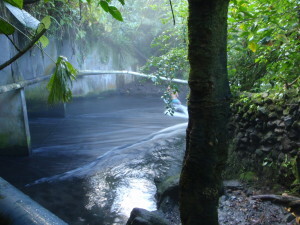 “Tabaconcito” is the antithetic free version of Tabacón Grand Spa Thermal Resort. It’s a little industrial up near the bridge, but as you move downstream the jungle closes in over the terraced pools and mini-waterfalls. It’s not clear exactly what the rules are now at Tabaconcito. 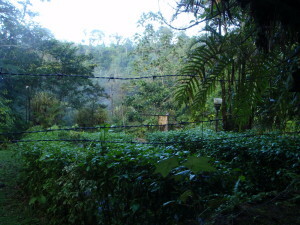 The property facing the road is private and the old parking lot is gated and signed no entry, but there are gaps in the barbed wire and paths down to the river on both ends of the bridge. Use of the area seems to be controlled mainly by burly parking attendants that patrol the lots near the entrance of Tabacón resort and the road on both sides of the bridge threatening to tow the car of anyone who’s not a paying customer. Backpackers and locals who can figure out how to arrive without parking can again fish a cold imperial out of a cooler on the bank of the Río Tabacón and let the pounding hot water massage their shoulders while feeling superior that they’re clever enough not to shell out $8 for the same beer and $70-$95 for the same water. Tourists across the road, inside the walls, surrounded by concrete diversions and sculpted gardens can of course also feel superior since they’re upstream 100 meters and if someone’s kid pees in the pool you know where it is headed.